Located in quiet, lovely Sausalito with fab shops & restaurants yet close to all SF has to offer. Like a treehouse with 1 bedroom/1 bath, full kitchen, deck, fireplace, parking & more. Sausalito laws do not allow short-term rentals so I only allow rentals of 30 days or more. The entire flat is yours. Designer done to be as comfortable as the best boutique hotels but with more space with a full kitchen and off street parking. Recently renovated. Lots of light, nice deck with a partial bay view from the deck. This flat is one level of a peaceful mid-century duplex that feels like a tree house and reveals the bay as you step out the front door. As the City of Sausalito bans short-term rentals, this unit is only available for rentals of 30 days or more. I'm sorry but current limitations within the Airbnb UI do not allow my home to show up if I only list as 30+ days or more -- know that I will not accept short-term rentals as I do not want to subject my guest to additional taxes, fines or harassment. If you want more information on the current short-term rental situation in Sausalito I am happy to provide it but know that it currently is against local laws to rent for less than 30 days. Very nice place for one or two but in a pinch can accommodate up to four family members or good friends. Very comfortable space with high thread-count linens on the queen sized bed (in bedroom) and the couch is queen sized convertible in front of the fireplace. A great retreat in one of the most sought after spots in the world. Sausalito is a San Francisco Bay Area treasure and this comfortable, stylish home is located 1 mile north of the Golden Gate Bridge. So you have the best of San Francisco available to you in a beautiful quiet setting. An easy launch pad to explore the California coast, Muir Woods, Mt. Tamalpais and the wine country. Or, you can just spend your time walking around Sausalito exploring the lovely village with its things to do, galleries, great restaurants and shops. Fully furnished featuring Euro kitchen (gas stove, dishwasher, gourmet tools and more), fireplace, wifi, flat-screen tv with premium cable & DVD, stereo and a nice deck to dine and relax. Great place for a vacation or to stay for work in the S.F. Bay Area. Sausalito is just over the Golden Gate Bridge or an easy ferry ride to San Francisco and a it is an easy, short trip to the wine county and coast. If you are working in San Francisco your commute is easier and quicker than many S.F. neighborhoods. Off-street parking but you don't need a car with great public transportation just blocks away. Non-smokers only. Will consider pets but due to two recent unfortunate issues with pets I have to take a more restrictive policy considering pets. You will have to agree to additional house rules and an additional deposit. Discounts given for longer stays. This home is an easy walk to the bus or ferry to whisk you to San Francisco or you can stroll the charming waterside village of Sausalito with great restaurants, shops and galleries. Parks, tennis courts, hiking and bike trails are just steps away. The host has lived in the area more than 20 years and will fill you in on all local secrets for whatever your passion is -- wine tasting, yoga, hiking, biking, shopping, food and more. This flat is in the Old Town section of Sausalito on the South end of town and is 4 blocks from the bay, 1 mile north of the Golden Gate Bridge. There is a great neighborhood market and is an easy walk to the Center of Sausalito where you will find lots of shops, restaurants, galleries, cafes, yoga studio, movie theatre and two ferries to San Francisco. She walked me through everything I needed for the apartment. She really cared that my family and I had a good experience. The area is excellent. I would recommend Annie's apartment to anybody. Sausalito is such a beautiful haven just a 25 minute ferry ride from San Francisco and Annie's apartment is perfect for a stay. It's a lovely homely place nestling amongst the trees in the hills of Sausalito with a happy relaxed atmosphere and everything you need. A real home from home. Annie is very attentive and sees that you have everything you need too. I'd completely recommend it to anyone. BTW, get breakfast at the Lighthouse cafe and you'll not need to eat again all day! The condo was perfect for what we wanted. It was a nice short walk from downtown, and we were able to walk everywhere we wanted to go within Sausalito. The only complaint I have, is that we had our typical late summer in Marin county this year, and it reached temperatures of 84 and 86 on the last two days of our stay. There is no AC or fans in the condo, and the breeze through was minimal, so we found ourselves trying to stay out of the condo as much as possible during the day to beat the heat. The first to days were much cooler, and the condo was nice and cozy (the heater makes it warm in there fast...even without it on due to the pilot light being lit). Additionally, when walking everywhere, you must keep in mind you're up up up the hill, so be prepared to climb up the hill back to the condo. My wife and I didn't mind, but some might want to consider that. It was great having the kitchen, and though the condo was cozy, it was a perfect retreat for my wife and I to celebrate our anniversary. Annie was a great host, and gave plenty of tips, pointers, and a manual for how everything in the condo works / where to find everything etc. We probably wont stay there if we go up in October again, due to the heat in the condo (it just wasn't comfortable when it is that hot), but in a cooler month, we would definitely come back. Annie was Great, really friendly and welcoming! The place was ready on time, clean and well stocked. The place is every bit as beautiful as it looks in the photos. Sausalito is very picturesque. It's not right in the middle of downtown, but it was just a short walk to food, groceries and sights. 10/10 would go again. We had an amazing 2 night in Sausalito @ A's house. It's beautiful decor and cozy surroundings were perfect for the 4 of us. I would definately stay here again, and would recommend others to stay here (perhaps instead of in sf). Is is so close to the city, but would never know it. Thanks you so much again for letting us into your home, and taking so much care in our trip to the bay area. A great little place in a great location. Easy communication with the host. The location is amazing, a beautiful walk along the water to downtown in 15 minutes. The space was immaculate and cozy, perfect for our weekend out of SF. Sachi's place already looked great in the photos, but we were even more pleasantly surprised when it turned out to be a gorgeously decorated apartment with artful and lovely touches like beautiful orchids, unusual plant decorations, stylish decor and furniture. I felt like we were staying over with super hip friends who knew exactly how to decorate. Additionally, the location is perfect for anyone looking to explore Sausalito - it's located just a couple blocks from the main boardwalk in a beautiful neighborhood - and it was seamless to get in and out of the place. It turned out to be a perfect short getaway for my boyfriend and I to celebrate a birthday. We'll keep this place in mind to come back to in the future! Take a break in a serene environment or perhaps complete a writing project in our private studio space. You'll be surrounded by trees and florals, with a beautiful bay ocean view of San Francisco. There is a small kitchen to cook a romantic meal, and the decor is both rustic and modern. We've worked hard to provide our guests with the comfort you'd expect if you were living in your own home. Whether your stay is short or extended, we hope you'll consider this location your home away from home. This is a charming lower full-apartment complete with a kitchen, dining area, refrigerator, 4-ring burner stove and microwave. The living space has a TV where guests can sprawl on the day bed, which also has a pull out trundle bed for an additional guest. On the lower level, guests will find a "writing corner." The bedroom also has its own view of the bay and has been furnished to provide a calm and relaxing atmosphere. Take a 10-minute walk down a set of public-access stairs and you'll find yourself in downtown Sausalito. It's also only a 15-minute walk to the Ferry Terminal, where you can catch a ferry ride to San Francisco. There is an abundance of nearby hiking trails for your leisure or workout routine. Ah, tranquility ... Secluded perch high above the bay with hiking access to the Marin Headlands mere steps away. Views of Angel Island and Belvedere from both levels. Luxe amenities: Caphalon cookware, Wusthof knives, Viking appliances, goose down bedding, empty closets, fridge ... 1,200 sf. For couples, artists, musicians (pianists!) solo adventurers, and business travelers. NOTE: NO CHILDREN. MANY STAIRS - MUST BE MOBILE. MAX: 2 ADULTS; NO VISITORS. MUST BRING CAR - NO UBER/TAXI. The house is secluded and quiet, and maintained for guests with no personal effects present. Enjoy a bath in our large tub, make yourself an espresso (on us), curl up in front of the gas fireplace, drink in the water views. Parking in the driveway. Our "secret local" trail is steps away and provides easy access to the Marin headlands and views of the Golden Gate Bridge and San Francisco skyline. Please note that there are no blinds in the house to take full advantage of the views. In the mornings, there are views of sunrise over the water. If you are sensitive to light, please bring sleep masks. Our neighborhood is one of the most peaceful in Sausalito, with lots of outdoor space and stunning views of Angel Island and Belvedere. Watch the sunrise over the water, and the boat traffic over morning coffee -- sailboats, sculls, kayaks and ferries glide across the bay. We are close to National Park Service land and the critters from the wild lands -- foxes, deer, hares, coyotes -- are our neighbors and friends. Our neighborhood is very quiet and we must have quiet, polite guests to maintain our listing. Occupancy is a maximum of two adults - no visitors, absolutely no exceptions. Une belle découverte de cette ville, tout près du golden gate avec plein de belles choses à voir ! Les adresses locales fournies sont très intéressantes. Niveau restauration, ne pas hésiter à aller au "Bar bocce" , le "Sushi Ran" lui est excellent mais assez onéreux. Una fantástica casa en un lugar maravilloso . Poder disfrutar de las vistas y estar en medio de la naturaleza con todas las comodidades que te ofrece la casa hace tu estancia inolvidable. Alex nos recibió el primer día y nos explicó como funcionaba toda la casa, muy amable e interesado en que pasáramos una agradable estancia . Si estáis en Sausalito , recomiendo este alojamiento . Indispensable tener vehículo para llegar a la vivienda. Couldn't have asked for better views and location! Great place to take a vacation but still have all of the comforts of home!! This home has stunning views of the bay, the islands and the hills of Sausalito from every room in the house. The layout, design, furnishings and details are attractive, warm and functional. Great library and a multitude of cozy spots indoors and out to read. Nice open kitchen with all the kitchenwares and utensils you need to cook. Great care went into making this rental feel like home. Instructions and communication was thorough and clear . . .Only difficult part was leaving. The views are amazing and the house is designed to take advantage of them. The hosts are welcoming, knowledgeable about the area, and respond quickly to any questions. The house manual is informative, especially about all there is to do, but we liked just staying at the house and taking in the views. Susanne was a great host. Warm welcoming even I was late. Supply a lot of information about what you can do in the area, restaurants, hiking tracks, place to visit…. Her place is very comfortable, highly quality equipped, in a perfect location for stunning hiking but also for resting in a super calm neighborhood. View as on pictures. Perfect to admire containership sliding behind angel island or to discover one of the many fascinating books you can find in the house, near by the fireplace. Feel like home. Thank you, Susanne! This home is better than what we hoped for. Beautiful views from every room. Very modern. A great place to stay. Charming, private, & incredibly spacious, modern mother-in-law suite attached to home. The location is just ideal for visiting San Francisco, Sausalito, wine country and magical places in northern California. It is a 10-15 minute walk to ferry (going to SF), a few minutes from GG Bridge and a short walk from DT Sausalito, restaurants and more! Guests are enjoying the spaciousness, cleanliness and layout of the suite. Beyond that, they are amazed at the total privacy they feel when they enter. Sausalito is a charming, lovely town right on the SF Bay. The views, the minute you go through our gate, are breathtaking. You can leisurely walk to town for breakfast or enjoy coffee and a light breakfast right in the suite with our small kitchenette that is provided for your comfort. Best AirBnb in the area! I stay here whenever I am in town and the place is perfect every time. Very awesome place and in close proximity to the hwart of Sausalito. Great stay and very good hosts. I would definitely book again! We absolutely loved this AirBnB which served as our base for exploiting Sausalito and the surrounding area. This space is upscale, sleek with a super comfy bed. The bathroom is luxurious and the shower was amazing. Enjoyed early morning walks down to the water and strolls along Bridgeway exploring shops and restaurants just a short walk away. Our hosts were so warm and friendly and really cared that we had everything we needed. This was a perfect home away from home and we highly recommend. Great spot just outside downtown Sausalito and a short walk into town. Plenty of space and a huge comfy bed and bathroom, would stay again for sure. Awesome place, great location, and fantastic hosts. I highly recommend! This is a gem. Beautifully furnished with masses of very thoughtful extra touches such as fresh flowers, cake, chocolates and wine on arrival. We have had an amazing stay at this apartment - nothing is too much trouble. The bed is extremely comfortable, the bathroom superb and having an extra sitting room and heating for the cool San Francisco March evenings a treat. Sausalito makes a charming and very convenient base for exploring the Bay and city. We will definitely return. Our stay was incredible! Our host went above and beyond as our schedule kept changing. We love the home, so much attention to detail and ever so comfortable! We will definitely be back. Cannot recommend this beautiful space enough! Private, quiet, light, airy and open house nestled in a walled garden. Walk the steps to the waterfront and ferry. There have been 4 engagements in this house. It's a love shack! Fully renovated, great feeling, light and very peaceful designer artists home (duplex) in the Sausalito hills. All new appliances. New kitchen, bathroom and hardwoods. Includes the following: - 1 King size bed with European pillow top mattress - Living room - 2nd bedroom full size platform bed - Aero bed for additional guest upon request - Hair dryer - Iron and ironing board - Washer/dryer - Dishwasher - TV/Comcast cable - Wifi DSL included - changed to Comcast - Utilities included - Garden - Car deck parking for 1 car behind my mini or on the street - free parking - Water views This house is built on the site of the old water tower in Sausalito so the front garden is enclosed by a rock wall and being about 20 steps down from the car deck it is very secluded and private. I had been living in China and bought this house when I decided to return to the San Francisco Bay Area. It was owned by an opera singer who lived in it from the time it was built. When I bought the house it was in disrepair but over the last two years I have renovated it and brought back the light and life that I know was once here. This property is only available for short term rentals of 30 days or more as per Sausalito short term rental laws. Sausalito is a great mix of salty sailors, art galleries and up and coming restaurants. There are numerous places to eat on the water or along the locals street. And the city is a ferry ride of 15 min drive away. I love the fact that although Sausalito sees it's fair share of tourists, it's twinned with Portofino, the locals still have a lot of influence with summer jazz in the park and music in local restaurants nightly. I wouldn't live anywhere else in the Bay Area. It's magical. Apparemment plein de charme bien situé, avec une vue dans les arbres. Nous avons passé deux jours très agréables. Logement très lumineux, spacieux et propre dans un environnement très calme. Très belle vue sur Alcatraz. Sausalito est extrêmement bien placé pour visiter San Francisco. Le ferry évite de se servir de sa voiture. 20 minutes pour rejoindre le ferry depuis l'appartement. Tanyia was super accommodating, very responsive and reliable, and her home is gorgeous! The view was stunning - you can see Alcatraz. Our stay was fantastic - thank you! Beautiful location filled with natural light. The bed is an absolute dream, I could stay tucked in there forever. Third time at Tanya's, and it felt like home right away. Hope there will be a fourth time. Tanyia's place was fantastic! Had a perfect little getaway with my wife, baby, and dog tucked away in the hills of Sausalito. Great views during the day! Couldn't have asked for a more chill 30th birthday. Be still my heart. This is a love nest. The energy in this home is rare. Our family spent a wonderful five days here, taking day trips over to the city by ferry and GG Bridge. Visited Muir Woods, Stinson Beach, Santa Rosa, all the sites of the city. One thing to remember is the GG Bridge is a toll bridge and you have to sign up w/ your credit card before you drive over it, or within 3 days of travel. We had a fabulous time. Explored local restaurants and shops and generally relaxed. The bed is the best I have ever slept in. Unless you are driving a tiny tiny car, you will have to park on the street. It's not difficult, but it's not convenient either. Guests must exit vehicle before you park, because you must park so close to the edge of street you can't open the doors. Needs more light at night at front entrance at top of stairs, cement is cracked and easy for an accident to occur. Once you are in the house, you forget about minor inconveniences. We would stay again. This charming Sausalito home features a remodeled kitchen, a living and dining area with a fireplace and partial view of the Bay and Angel Island. The location is just steps away from the main waterfront downtown street of Sausalito and the Bay, with all its shops, restaurants, cafes, bakeries and more. One day rentals available for $895/day Two-day rental available for $595/night Available for long term rental at a discounted rate. Going up North, It's 50 minutes away from the Wine Country (Santa Rosa, Healdsburg, Geyserville, Kenwood and Sonoma). Driving down South, Silicon Valley including Palo Alto, Saratoga, Cupertino and San Jose is just less than one hour away. There is a great Italian restaurant just one block from the house. Keep walking 2 blocks down to the Bay and a view of Alcatraz and San Francisco. Downtown Sausalito is just a couple of blocks away, yet the street is secluded and the house is very serene. There is a private beach 2 short blocks away in from Main St. On your walk to downtown, it is not unusual to see seals. Enjoy your morning coffee from the living room, watching the sailboats in the Bay! Thanks for having us, it was a great stay and will certainly be back! Its a nice place. Transportation to SF is easy and Sausalito is worderdull! This house in Sausalito was amazing! It had everything we needed for 6 adults. The house is on 2 levels and both are beautifully decorated with great attention to detail. The sitting area is large and bright with views of bay. The modern kitchen has everything you need for cooking plus tea, coffee and milk was available which we appreciated. I loved that there was a laundry room downstairs with ironing board set up, made life so much easier. The owner has parking passes so we could park just outside the property. We found a great little market a few blocks away. There is a 10-15min scenic walk to the ferry terminal and downtown. So you can leave your car and explore. We went to San Francisco for the day $18 return which was an awesome stress free trip. Also I used Lyft, who knew the backroad shortcuts in Sausalito and cost $7. We tried some local restaurants but our favorite was Murray Circle, excellent food and service, just a short drive away. We had a great time, sad to leave such a great place. Alia's place is an absolute gorgeous place that I would recommend that all guests who want to be within a quick driving distance (or ferry ride) to the city (SF), but also want great views from the living room and to be within walking distance of downtown Sausalito. The house is clean, stylish, and relatively spacious for 8 people to stay. The kitchen is sleek and modern, the living room space is beautiful and gives you a fantastic view of the bay, and all of the accommodations are in place (towels, toiletries, etc.). We really enjoyed our stay here -- the house is in a great location close to downtown Sausalito, but also only a 20 minute Uber from San Francisco. It slept 7 comfortably and the owners were very responsive whenever we had questions. Thanks again! Super nice host and lovely house which was much better than explained! Alia was very nice and sweet enough to respond to my inquiry as quickly as it could be. Location also was just perfect for my team to go to downtown SF for meeting and to attend exhibition-we usually drove since we had to move place to place for different meetings, but when I had to go out alone, I took ferry and it was faster during the rush hour. Also nice bars and restaurants with wonderful view of ocean were in walking distance so I could take my team out to have drinks and food without worrying about driving. It was shame that I couldn’t come to this beautiful place with my family for it was biz trip this time, but I will definitely come back next time with my family. I would recommend this place to anyone who’s planning to take a trip to Sausalito. Alias place was great. the place appears to recently been remodeled. Very comfortable home. Location is fantastic....about 2 blocks from the public walk along the bay. Finally I thought parking might be a challenge but we had no trouble. All in all a great place to stay! Perfect location, walking distance to downtown, great views! Very clean! I would stay again!! Glorious views of San Francisco Bay/Alcatraz, Angel Island. This spacious 1 bedroom comfortably sleeps 2 and is a casual stroll to downtown Sausalito. The kitchen is fully equipped and just around the corner is Golden Gate Market, less than a block away. Sausalito is often referred to as the California Riviera with its many boats, houseboats, restaurants and shops. Its storied history of artist, famous musicians and eccentric characters make it a one of a kind spot. This upper unit of a duplex has all the modern conveniences as well as spectacular views, private entrance and deck, rear shared patio and detached laundry room. Your very own off street parking space in front is a big plus. It's proximity to San Francisco, hiking at Muir Beach/Woods -Golden Gate National recreational area and swimming and tanning at Stinson Beach make this a vacation paradise. This is a prime location, you can walk into town and its within 10 minutes to the city of San Francisco, Whether you walk, bike, drive or choose to take the bus or ferry, ALL are easily done from here. Located in 'Old Town' section of Sausalito...splendid views of the Bay, close to the water makes walking down to the bay, downtown and all local attractions very easy. Leave your car and utilize local ferry and excellent public transportation system nearby. Minutes from Golden Gate bridge and freeway, so Napa/Sonoma Wine country, and quaint towns of Mill Valley, Tiburon and Southern Marin are close by. Explore West Marin (Stinson Beach/Muir Woods, and Point Reyes National seashore)- or experience wonderful San Francisco for easy day excursions. Many local hiking and biking trails are nearby-explore our glorious Golden Gate National Recreation area...bike rentals located in downtown Sausalito. Wow! vraiment un endroit paradisiaque! Nous avons très apprécié cet appartement lumineux et ensoleillé.. La vue y est magnifique... Avons pris le ferry pour se rendre à San Francisco et visiter. Nous recommandons cet Airbnb. Tres bel appartement avec vue magnifique sur la baie,Alcatraz et San Francico. Appartement idealement situé avec vue magnifique sur la baie de San Francisco. A recommandé. Excellente localisation à Sausalito. Nous n'avions qu'à traverser le pont pour nous rendre à SanFrancisco. On a une vue exceptionnelle d'Alcatraz et de la ville de San Francisco. On a assisté au feux d'artifice du Nouvel an de notre balcon. C'était juste wow. Erick was quick to respond to every email I sent concerning check-in and anything else we would need. Kayla was there when we arrived, and helped us bring our luggage in. Totally happy and comfortable with our experience. This beautiful place is exactly as depicted in the photos and description. It was uncluttered, spotlessly clean, and in a wonderful location. After spending several hectic days in San Francisco, this is just what we needed. The view is amazing and I took some beautiful pictures of the bay filled with sailboats and some incredible sunrise shots. The kitchen is fully equipped and on Saturday we went over to the SF Farmer's Market, bought lots of veggies, and came back and made a wonderful dinner with them. It's an easy walk to downtown Sausalito, with great restaurants, the ferry to SF, and the bus stop, so it's easy to get anywhere from here. We visited Muir Woods on Sunday, and all we had to do was take the bus - no hassles with parking. You really don't need a car here! There's a small grocery/market just down the street. Our hosts have a good selection of DVDs, in case you feel like watching a movie, but we chose to just relax and chill on the balcony most of the time. It was unusually hot in the bay area, and since most places have no a/c, it was great that we could open the windows in the front and back of the house, and get a cool breeze. The air here is fresh and the views really are amazing! Thanks Erick and Kayla for offering such a lovely place! It really made our trip relaxed and carefree. This 1910 carriage house is a detached 850 sq ft home in the beautiful back garden of owner's property. It's located in the Historic Old Town neighborhood of Sausalito (a seaside town with breathtaking views of San Francisco Bay and the city). Note: Given the laws in Sausalito prohibiting short term rentals, the carriage house has a min 30 day rental. If you wish to stay for over 30 days, the nightly rate after that is equal to the monthly rate divided by 30. We also accept long term leases. Below are features of this beautiful property. Please contact us if you have additional questions about the property or booking dates: • Arrive to a welcome tray with a seasonal, organic treat from Owner's favorite local coffee shop to help you settle into the moment. 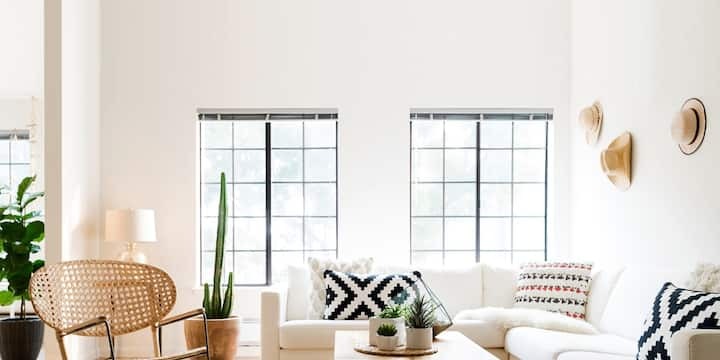 • Be inspired by the home's wonderful character throughout interior - fresh and airy painted all white interior and lovely hardwood floors, bead board ceilings and trim, shingle exterior. Renovated kitchen with granite countertops, appliances, and tile flooring. Victorian-style pedestal sink in bathroom with shower. Bedroom upstairs is on its own floor with high ceilings and lovely hardwood floors reminiscent of boat deck flooring. Great place for watching the sunrise. Partial view of san francisco bay from front porch, as well as your living room, kitchen, and upstairs bedroom. Private garden entrance through picket fence with easy street parking using owner's free guest parking pass that is provided during your stay. • Convenient access to inspire walking and public transportation - only 2 blocks to the waterfront, restaurants and public transportation bus stop, grocery store and coin laundromat or laundry/dry cleaning delivery service, 10 minutes to the Sausalito ferry terminal and shopping boutiques in town in one direction, and marin headlands national park in the other direction. 15 minutes into San Francisco across the golden gate or 30-45 minutes by bicycle. • Fully furnished with all necessities including queen size bed, dining table and chairs, side tables, couch, rugs, dishware and much more all in owner signature urban farmhouse style . Enjoy one-of-a-kind vintage items hand selected by owner at antique markets around the world designed to inspire you to slow down, simplify, and live life with passion. • Enjoy owner’s favorite decorating magazines and spiritual awakening, travel, organic cooking and lifestyle books. Note: we only book visits for 30 days or more. Breathtaking views of entire San Francisco Bay. Historic charming homes from 1800s. Secret garden paths to walk and explore. Beautiful walking to downtown by waterfront. 10 minute walking to all public transportation (buses, ferries etc). It is the dream place to stay. Wonderful house, location and views. The carriage house is very private and offers great views of the city. This rental is in a very walkable area with many restaurants. The upstairs is all one bedroom and the downstairs offers a pull out couch, we comfortably slept 3. Beuatiful location and perfect escape for our little family. Great base to launch your stay in the Bay Area. This cottage is quite, with wonderful location and views. Yasmine is a very considerate hostess and truly cares about her guests comfort. Yasmine's cottage is ideally located in Sausalito, 5mns from everything downtown, after a beautiful walk along bridgeway. Cottage itself is really quiet and relaxing , and decorated with good taste. Yasmine is very attentive to any detail and kept reachable for any question we could have. At last, Sausalito was a good base camp choice during summer, as weather were often sunnier than within SanFrancisco itself. Would recommend Maison Reve without any doubt ! A charming little house, beautifully decorated and very comfortable. Amazing location with views of San Francisco Bay and walking distance to Sausalito shops, bars and ferries. I would highly recommend it. Great place to be close to SF yet far enough away to be away from the crowds. We stayed in November so it was easy to get anywhere, hiking, restaurants, the ferry, or to SF. The carriage house is cozy and quaint. The description provided by Yasmine is accurate. Lovely cottage, kind hosts, a lovely escape. Will stay again. This is a tranquil oasis with view of San Francisco, surrounded by private gardens. San Francisco is 20 minute drive across Golden Gate Bridge or ferry boat from Sausalito. Two fireplaces, two bathrooms, decor will put you at ease. Famous provenance. cccOur bungalow has old bones that sometimes creak, figuratively speaking. It serves now as romantic getaway or tourist base. It is not the Ritz but it does have new white linens and a laundry closet for refreshing them. The windows are left undraped so as to seamlessly blend the privacy of outdoors within. The entire property is fenced. The kitchen is equipped simply as a vacation property, and you can slow dance in it. Sausalito has much to offer and the views from this original Gump guest cottage are spectacular. It is peaceful and the decor serene. Petite maison très sympathique avec une très jolie vue sur la baie de San Francisco. Parfaite pour un séjour en couple ou en famille. Tout est décoré avec goût et les propriétaires sont très gentils et réactifs. Je recommande sans hésiter ce logement si vous souhaitez séjourner à Sausalito. Seuls points négatifs: il manque des rideaux dans le salon et dans la chambre principales; les 2 cheminées éthanol sont difficiles à utiliser et ne produisent qu'une petite flamme assez décevante. Situation de la maison parfaite, très belle vue sur San Francisco, communication facile avec Constance et Dr Paul. C'est une location très agréable pour 2, si l'on prend ses repas à l'extérieur. Au moindre problème, Constance et Dr Paul sont très réactifs et souhaitent vous être agréables. We had a lovely 4 night stay at Dr. Paul's place in Sausalito. The views are breathtaking and the home charming and comfortable. We had a bit of a heatwave during our stay, so didn't enjoy the fireplaces - but I imagine it would be quite cozy in cooler weather. The hosts were pleasant and accessible and did all they could to make our stay convenient and hassle free. I could have stayed much longer and been very happy. Great location and view. Very nice to work with owners. We were on a road trip from Southern California and we arrived an hour early. Dr Paul's representative Constance, was gracious about an early check in. We were tired arriving from a state park and it was great to be able to have a hot shower and relax instead of driving around for an hour. We had a very relaxing and enjoyable time staying at this property. Beautiful, great stay in Sausalito! Host gave great directions and was easy to communicate with. One heads-up for guests; there were only curtains on one window and no screens at all. Otherwise, it is very open (which is great for the views) but took some getting used to. There is a huge window across from one of the toilets and my teens refused to use that bathroom. The location is surrounded by trees and quite private otherwise. Thank you for a great visit! Charming house for sure, with sunshine pouring in from the beautiful sliding glass doors! We shared the house with our friends for a few days, and the four of us were very comfortable. There are a few quirks about the property - first off, there is one bedroom with a door and its own bathroom. The second "bedroom" is a murphy bed that is in the open area, I'm assuming to be the dining room. It too has a bathroom. But it's not private at all, and what this does is eliminate a dining area. So you need to eat outside at the patio table, or eat indoors around the coffee table in the living room. We had beautiful weather, so it wasn't a problem. Second, there is no large refrigerator and no freezer, but a mini-fridge thing in the kitchen along with a separate ice machine. Not a huge deal, but keep in mind that your space is pretty limited. Lastly, and the reason I only gave the place 4 stars, is that we thought from the pictures that we had unobstructed views of the water and the city, only to find out that large trees block about 90% of the view. It was a bummer to only see a sliver of the view from a corner of the deck. If the trees were cut, it would be stunning! Dr. Paul's cottage was the perfect getaway We stayed over 4th of July and were able to enjoy the small town (old style) parade in town, then watch Sausalito's fireworks show from the back porch. Since it was a typical "June gloom" weekend on the bay, we were also able to take full advantage of the fireplaces:) There is a small public park next door, which some of the locals use as a dog park; we did, too, and our pup was able to make new friends. We also appreciated the fantastic communication with Constance. Our cottage is right behind our main home which is on the waterfront and offers you a romantic, 1 queen bed and bath cottage with access to our private beach and the Sausalito boardwalk. Includes a fully stocked kitchen for your vacation pleasure. Including milk, coffee, wine and a few treats. A built-in heater, sky-window, satellite television, and WiFi. Unparalleled access to San Francisco and the bay. Free Kayak use and bike included. We have a private beachfront with kayaks for your enjoyment. The Bridgeway boardwalk is in front of the home and you can step right in front of the house to enjoy the Sausalito township. Only minutes drive or 10 minute bike from the Golden Gate bridge. Market directly behind the house serves incredible coffee and many amenities. Sausalito is a unique and picturesque community, perched on a hillside between the San Francisco Bay and the Marin Headlands. OUTDOORS For outdoor enthusiasts, there are hundreds of cycling, walking and jogging paths to discover in the surrounding Marin headlands. Many Sausalito residents and visitors choose to do a city-style hike across the Golden Gate Bridge. This famous bridge spans 1.7 miles across the San Francisco Bay and into the Fisherman’s Wharf section of San Francisco. After hiking across the bridge, families often enjoy boarding a ferryboat water-taxi for their return trip to the City of Sausalito. Ferry Services are available until dusk each day. FARMERS MARKET The Marin Country Mart Farmers Market is a rain or shine market, operating year round on Saturdays from 9:00 am - 2:00pm. Here, you can shop for the best local and organic produce, flowers, pastured meats, seafood, organic cheeses, yogurt and milk, breads and baked goods (plus gluten free), nuts, confections, olive oil, and jams all the while, with great views of Mt Tam and the bay. Have brunch or lunch in the market's big tent, where you'll find shade in the summer and escape rain in the winter. Options include award winning grilled cheese, organic sausages and hot dogs from Belcampo Meat Co., organic soups & salads, sweet & savory crepes, handmade doughnuts and more! ART FESTIVAL Considered one of America's best art fairs, this annual outdoor festival takes place every year during Labor Day weekend. The festival is held along the Sausalito waterfront and draws crowds of art lovers as well as those who come for the live music and good food. The Sausalito Art Festival is a prestigious art event, renowned for the high quality of art exhibited and the extensive scope of artwork on display. HOUSEBOATS Houseboats have been part of Sausalito's waterfront since the 1880s when they were used as warm-weather recreational boats and then pulled ashore during winter. After WWII and during the era of peace and love in the 1960s, the houseboats began to attract a free-spirited Bohemian crowd. Little flotillas of houseboats became vibrant artists' colonies. Sausalito houseboats are still home to communities of artists as well as other residents who appreciate the peaceful, alternative lifestyle. The idyllic scenery of the waterfront provides inspiration to painters, photographers, and sculptors. That's a wonderful B'day trip with my family to stay with the gorgeous bay view at this nice house, thank you, Ignacio! Absolutely beautiful views! Very spacious, modern home...perfect for our family of four. Incredible view of Angel Island with a wonderful deck space. This was the highlight of the house for us! Very close to downtown Sausalito. Great fireplace. The house has all wood floors and noise definitely carries so need to be mindful of this. Overall though a perfect place to stay to explore Marin! This space was absolutely breathtaking. The host was extremely accomodating, and the view from the back is stunning. I can't recommend the spot enough. Worth the splurge to spend time here. Modern-style residence with breathtaking views! Gorgeous views in a quiet, peaceful setting. Sausalito is a terrific base for a Bay Area vacation, with San Francisco ~5 min. away and wine country (Sonoma, Napa) ~45 min. away. Amazing views, very spacious and light-filled apartment with great equipment and extremely well-supplied kitchen. Very, very thoughtful indeed. Mark is a wonderful host. His house is lovely and the view of the bay is extraordinary. Mark provides nice touches like flowers, complementary wine, abundant bath towels, a great bar, fun library and his house is very clean. I especially enjoyed the 20 minute walk to the ferry on my way to work in SF. If you clicked on the link to check out this place, I highly encourage you to book it. Mark's place is gorgeous! It was a tranquil respite from the hub-bub in San Francisco and we were so glad we stayed on the Marin County side of the bridge, rather than in town. This home in Sausalito had every amenity we needed and even some we didn't know we needed - and a well-stocked bar to boot! We appreciated the well appointed kitchen since we prepared all of our morning meals and many dinners in the lovely home. The beds were comfy and you just can't beat the view from the living room. Mark's communications and instructions were perfect. It's a short walk into town to access the market, shopping and restaurants - but far enough away for peace and quiet. You don't need to look any further - book it! You won't be sorry! Gorgeous panoramic views overSan Francisco bay and the city. Close enough to the water (and the action) to hear water lapping and seals barking. Mid-Century Modern home by Mario Corbett, (Frank Lloyd Wright Contemporary) Fresh High End Renovation throughout with gourmet kitchen. Easy (not steep) 6 minute walk to ferry and Sausalito restaurants. Lots of sunshine, back yard, entertainment decks, gourmet kitchen and beautiful oak trees. Our home is an iconic example of mid century modern architecture, designed by notable architect Mario Corbett, who was in company with Frank Lloyd Wright and others of the school. The home was owned by only one family, until we were fortunate enough to come to own it. We undertook extensive renovations, but managed to preserve the original mid-century modern style. However, the kitchen had to be completely replaced, and we developed the outdoor area. We love the ocean, and we love forests, and our home reflects that. It is hard to decide where to look - each room of the house has panoramic, uninterrupted, every-changing views of the water, San Francisco City, Alcatraz, Bay Bridge and Oakland. We also have a beautiful back garden (unusual for Sausalito), with a grove of native California oak trees, and two decks with views to the city. Upstairs Features a large flowing open plan space comprising entrance, guest bathroom, large living room, with Home Theater, new gourmet kitchen with redwood counter tops , and formal dining room. There are three bedrooms downstairs. Bedroom 1 is the original master with a lovely new expensive King bed. Bedroom 2 is a standard sized room, with Queen bed, Bedroom 3 is smaller with Queen bed and adjoining with a sliding door to Bedroom 2, so this could be one large bedroom or two small bedrooms, at your discretion. There is a dining table in the living room (seats 6), kitchen bar (seats 3), and back yard deck dining set (seats 8) with BBQ Grill right off the kitchen. The neighborhood Sausalito is a wonderful, historic town. It has gorgeous restaurants, wooden boats, a quirky artistic community, and a ferry direct to the city and Fisherman's Wharf, so it is a great hub for visiting San Francisco. It is also close to the mystical Marin hills and forests, so it offers guests the very best of city, water and nature. Nearby are the mystical Muir woods with ancient redwoods (25 minutes drive), and the famous Marin country hiking trails. Also nearby is the gorgeous scenic drive up along the rugged coastline. Mount Tamalpais National Park is 30 minutes drive, Stinson beach and the hidden hippy town of Bolinas are about 40 minutes drive. Much of Sausalito is foggy, and up steep hills, but our home is in the famous banana belt, meaning it is a manageable 5-10 minute walk to the ferry, and in the most lovely, sunny part of the town. THINGS WE LOVE TO DO AROUND SAUSALITO: Walk around the docks and look at the beautiful sailboats Visit the “intentional community” of artists who live on houseboats, tucked away out of sight of tourists (North West of Dunphy Park). Go to the mini beach where locals go, just a bit further North west of Dunphy Park, along the shoreline, also great place for kayaking or paddleboarding Go for a hike in the hills just behind us, or Mount Tamalpais National Park or Point Reyes. You can walk straight out the back door, through a few streets, and do a two hour hike up the mountains and back. Visit Tiburon or Angel Island Go up the headlands for the best view of San Francisco ever, visit the Nike missile site and abandoned military complex dating back to the War Visit the Bay Model Visit some of the quaint and quirky Marin towns: Stinson Beach and Bolinas on the coast, or inland Mill Valley, Fairfax, St Rafael Wooden boat tour, or floating home tour, with fascinating history, including a mini war between authorities and rebels in the hippie era. Both can be self guided - just wander around if you don’t like formal guided tours Shoot some hoops or play tennis a block away in a small, undiscovered public park (Cnr North and Third) Simply walk around Sausalito and look at the lovely houses and churches. You will find all sorts of stairs and alleyways. Look out for local festivals. The famous Sausalito Art show is once a year, Jazz on the water, sailing regattas and others Visit Muir woods, really close by. Busy on weekend, and many of the hikes in Mt Tam also have beautiful redwoods Ride Bicycles, in the birthplace of mountain biking Take a ONE HOUR drive to Napa (! woot !) Catch a ferry to the city. Fisherman’s wharf is touristy, but the ferry building and downtown are good The whole ‘tourist strip’ near the ferry is fairly mediocre, and we avoid it, but locals go to Caledonia Street (one street back from the main drag) Seafood Peddler (Check out their happy hour 5-7pm) Sushi Ran (best Japanese food we have outside of Japan or Sydney, and we have spent a lot of time in Japan. Make sure to book ahead) Le Garage (hard to find, but worth it) Bar Bocce is kinda fun. A bit crowded, but have an actual Bocce ball court, and firepits, right on the water Cibo is where the locals go for a coffee Fish (Harbor Dr) Hard to find, right on the water. Seahorse (Harbor Dr), lots of fun, with live music and dancing most nights, an eclectic mix of Cuban music, reasonably priced Italian food and art gallery Where to get a good steak in Sausalito? We don’t know yet, we haven’t found one, but we keep trying. Please let us know if you find it. When nothing but steak will do, we go to the strangely named “Buckeyes Roadhouse” fairly nearby in Mill Valley. Despite the odd name, it is actually quite classy, with fireplaces and a good but traditional menu. WHERE TO GET GROCERIES: Mollie Stones Great fresh produce and breads and artisan foods, but we call them “The World's Most Expensive Grocery Store.” Safeway is in in Strawberry Village, about 15 min North Whole foods in Mill Valley The best little secret in Sausalito is a grocery store a few blocks easy walk from the house. It looks like a mere convenience store and Deli, but inside is a decent little grocery store, with a simple but good range of vegetables, wines, bread and produce. Best of all, you can get food supplies by strolling down through a lovely little community garden at the end of Second street, and stroll back up again with a bag or two of groceries, about a 5 minute walk. Other things to note The local park is half a block away, with kids playground, tennis court and ball court, The local supermarket is a few blocks away - about 5 minutes walk. Beautifull house in Sausalito. Fantastic views and walking distance to downtown Sausalito. Newly renovated kitchen and outdoor spaces. Liesl is a fantastic host. Absolutely perfect in every way. I have stayed in many an airbnb, but this has outdone them all. Easy access to SF via Golden Gate Bridge and quick drive to Napa anytime. Truly a gem. This home is a great place to stay in Sausalito! The location is amazing - 5 minute walk to town to access the ferry and all the shops and restaurants. The house is large and comfortable with a great kitchen and a breathtaking view. Also the host was very helpful and there was always someone available immeadiately in case we needed anything. I highly recommend this Airbnb! Our waterfront home offers you a romantic, 2 bedroom, 2 bath home with a 1 king in a Penthouse Room and 1 king and 1 double in our 2nd Room. Incredible living room, dining room and fully stocked kitchen for your vacation pleasure. Central Heating, satellite television, and WiFi. Unparalleled views of the San Francisco and the bay. Private beach access, Free Kayak use and bike included. • Bathroom (including a bath) • 2 seperate single beds can be added to this room on request Other things: • 2 kayaks are available for use at no extra cost • 1 bike is available for use at no extra cost • Shared laundry with new washers and dryers is available • Google Home surround sound speakers for music • Central heating and air conditioning • Guest House: We have a separate Guest house that can be rented for an extra $250 per night *4 people for rate advertised, 8 maximum capacity, additional person charge per person per night for guest counts above 4. *This memorable home offers the best of peaceful Sausalito living and is conveniently located just minutes away from the historic Sausalito town with bars and restaurants and a 10-minute drive across the Golden Gate bridge to the city. Explore all that San Francisco has to offer here while enjoying the waterfront of Sausalito Other things to note We do offer two-night minimum stays Sundays-Thursdays. If interested in two-night minimums, please inquire by messaging us before bookings. The calendar reflects up-to-date bookings. Any availability will be seen on our Calendar - if interested in a date already booked, please contact us periodically for any cancellations. Sausalito Penthouse on Private Beach! This spacious 2 bedroom comfortably sleeps 4 and is a casual stroll to downtown Sausalito. Cook a meal at home and Golden Gate Market is less than a block away. Sausalito is often referred to as the California Riviera with its many boats, houseboats, restaurants and shops. Its storied history of artist, famous musicians and eccentric characters make it a one of a kind destination. paradise. This middle unit of a triplex has all the modern conveniences as well as spectacular views, private entrance and deck, rear shared yard and detached laundry room. Your very own FREE off street parking space in front is a big plus. It's proximity to San Francisco, hiking at Muir Beach/Woods -Golden Gate National recreational area and swimming and tanning at Stinson Beach make this a vacation paradise. L'appartement est à l'image de sa description, on s'y sent comme chez soi. Et quel plaisir de découvrir et profiter de cette terrasse face à la baie. Idéalement situé, il est à deux pas du centre de Sausalito et donc du ferry pour rejoindre San Fransisco. Sinon l'accès au Golden Gate est dès plus simple. Joli appartement à Sausalito spacieux dans un quartier très calme avec vue au loin sur la baie. Pour rejoindre San Francisco les transports en commun sont chers et prennent du temps mieux vaut utiliser un uber pour 4 personnes. Le centre de sausalito est agréable et on peut le rejoindre à pieds facilement de l'appartement. Très bon emplacement pour visiter San Francisco et sa région, très belle vue sur la baie. L'appartement est fonctionnel avec quelques produits de base, sans attention particulière. Très belle vue sur la baie de San Francisco. Belle appartement avec une jolie terrasse. Très bien placé (à quelques minutes à pieds de restaurants et café du bord de mer). Images fidèles au logement. Très bien situé et facile d’accès. Tout le confort est présent pour se sentir chez soit et se reposer. Nous recommandons cette adresse. La vus du patio est incroyable et l’hôte est très rapide à répondre. Merci Erik. Pas d'action particulière de bienvenu, mais réponses toujours très rapides et précises aux questions. Description fidèle du logement Nous avons aprécié la souplesse de l'hote sur l'horaire de départ. California Dreaming 2 Bedroom Gem! VIEWS! This 5 bedroom / 4 bath luxury retreat commands magnificent San Francisco Bay views, has a distinctive contemporary and modern feel, just a couple blocks to the beach / waterfront, with easy walking distance to San Francisco via the Ferry or the Golden Gate Bridge. Sausalito, California is often compared to Italy's world renowned Amalfi Coast. This luxury home boasts warm honey-colored Bamboo flooring, Granite counter-tops, designer accents, and recessed lighting compliment island & water views. Large Bedrooms (1 king, 3 queen beds, 1 single, + 1 full size sleeper sofa) and Spa-like Bathrooms, hot tub, steam sauna, European fixtures & vanities create a resort feel. Just a couple blocks from beach / waterfront, 4 blocks to downtown Sausalito, transportation, and just minutes to San Francisco and 45 minutes to wine country. This House is the perfect luxury retreat for a visit to the San Francisco Bay Area for short or extended stay. Maid, food, catering, transportation, floral and concierge services are available at extra cost as desired. Please note this house is offered as a long term rental (30+ days) in compliance with all applicable laws and you will be required to sign a rental agreement evidencing such agreement. Henry's house and its views are beautiful. We hosted a team offsite meeting there. The setup made us very productive and we had a great time. The reservation was canceled 29 days before arrival. This is an automated posting. Henry was great. We had a family Thanksgiving at his place. Everything was perfect . House was well equipped and the setting was spectator . It was a memorable weekend. Would definitely consider using his place again. This house is beautiful! So close to San Francisco city, with amazing views. The house was clean and welcoming on arrival. Henry made our stay super simple and easy and wonderful! Really hope to be able to go back soon! The restaurants and grocery store in walking distance helped too! :) Thanks Henry! We had a fantastic time at Henry's beautiful home in Sausalito. We had four couples for one night and wished it could've been a week. A wine and cheese hour on the patio overlooking SF Bay is a must. Henry provides a great list of local restaurants, attractions and tips. Would highly recommend this host and this home. The reservation was canceled 40 days before arrival. This is an automated posting. An absolutely beautiful home with stunning views. The house was clean, prepared and incredibly comfortable and spacious. We could not have asked for more! Beautiful waterfront condo available for monthly rental. Amazing views of city and the bay! Centrally located, quick walking access to the main thorough fair in Sausalito. Beautiful two bedroom apartment in a three-unit home. This apartment is very unique as the entrance to the home is via a dock, this home is literally right on the water. Your view from the house is of the entire bay, it's truly one of a kind. This location is fantastic, it's walking distance to the main section of town where there are restaurants, shops, coffee shops etc. Also easy access to the Sausalito Ferry which will take you into San Francisco. The apartment has its own private entrance. Views of the Bay. Easy walking neighborhood with great restaurants and activities(walking, biking, paddle boarding, kayaking). This was a beautiful home with an amazing view of the bay. Great location from shops and dining too. Thanks for a wonderful stay. If you're staying in Sausalito, my guess is that this is the best airbnb option possible! Place is amazing, clean ,and when you're sitting down, it appears that you're on a boat, cuz you're only seeing water. Very clean, and very professional interactions with the host. Well done. We loved this home and are hoping to stay again! The view is amazing, highly recommend. Amazing place to stay in Sausalito! Beach Access if you want to do some kayaking. This place is walking distance from the heart of Sausalito. Many great restaurants nearby. Modern Furnishing with so much space. Wake up to an amazing breathtaking view of the San Francisco Bay. The house was very clean. Beds were very comfy. Bathroom excellent. Furnishing modern and overall atmosphere relaxing. This place is the perfect weekend getaway. What an amazing place ! The apartment is bright and clean and very tastefully decorated. We just loved being there and listen to the sounds of the waves. Great location as well with many restaurants within 5- 10 mins walk and small food store just few steps away. Its just amazing to stay here. Living in a beautiful town and coming with a stunning SF view, the house has also provided a very comfortable and beautiful place for us to stay. I will come here again. Stayed here as a family with two small kids and loved it. It's even better than the pictures. Tasteful furniture and touches abound and the place is spotlessly clean. We spent most of the weekend just hanging out, looking at the view and listening to the sound of the waves. Golden Gate market is less than 2 mins walk with everything you need for breakfast including Acme bread and butchers bacon. We had dinner at Aurora Italian restaurant also very close and family friendly with solid food. Main drag of Sausalito is 10 minutes walk away yet this felt far from the tourist bustle. Recommended.